Drain Cleaning | Brooks Plumbing Co. However, our professional plumbers recommend that you not use them. Why is that, you ask? These chemical mixtures have a variety of severe side-effects that can actually hurt your plumbing, the people in your home, and the environment. Keep reading to learn about why we discourage store-bought drain cleaner. Do You Have a Drain Problem? The drain and sewer system in your home is perhaps the most vital component to a safe and happy household. It removes wastewater and similar contaminants from your house into the Olympia, WA civic sewer system. It likely sees daily use, which means that when problems arise, you need to address it as quickly as possible. The good news is that qualified professionals are standing by to help. But you still need to call them in and you can’t do that unless you can spot the signs that you have a drain problem. We’ve included a brief list of some of the more common symptoms below. Posted in Drain and Sewer | Comments Off on Do You Have a Drain Problem? Why Should I Use Professional Plumbing Services for Clogs? Plumbing clogs are a common occurrence and residents of Olympia, WA may be tempted to address them with a store-bought solution. Most hardware stores sell drain snakes, for instance, and chemical cleansers are available in any supermarket. Unfortunately, those products adopt a one-size-fits all approach which doesn’t always solve the problem and may even create new ones. A professional plumber armed with specialized drain snakes can address your clog the right way and ensure that your pipes are functioning exactly as they should. 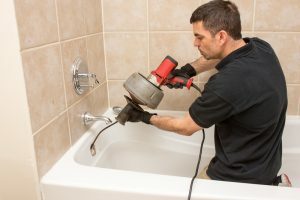 Posted in Plumbing | Comments Off on Why Should I Use Professional Plumbing Services for Clogs? It slides slowly down the insides of your drain, clinging as it goes. When it finally deposits, it hardens into a thick, impenetrable layer that will slow and eventually clog your drain. This slimy, sticky mess is what’s known to professional plumbers as FOG: fats, oils and grease. And once FOG takes hold of your drains, it’s very hard to get it out. But fear not: there is one highly effective tool against all FOG, and that’s professional drain cleaning. The plumbing experts at Brooks Plumbing know FOG well, and they have the training, expertise and tools to completely remove FOG from your drains and garbage disposal – all you have to do is give us a call. A lot of people will tell you to pour hot or boiling water down your clogged drain to get rid of the grease, but when it comes to FOG, hot water can actually make the problem worse. Why? 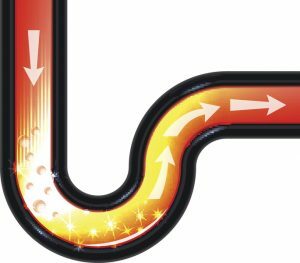 Hot water melts FOG and pushes it further down the drain; when it cools, it simply re-forms the build-up, but it’s now much deeper in your plumbing system. A home remedy that may work, if the build-up isn’t significant, is a combination of baking soda and white vinegar, but if this doesn’t help, it’s time to call for a professional plumber for drain cleaning. Professional plumbers use two main types of tools to clean your drains and remove FOG build-up. The first type is an auger. Also known as a drain snake, augers come in a wide variety of types and widths, but the design of the tool is basically the same no matter what the size. Augers consist of cables that can be snaked down drains. Different types of heads can be attached to the auger, and many augers are motorized to maximize on the power. 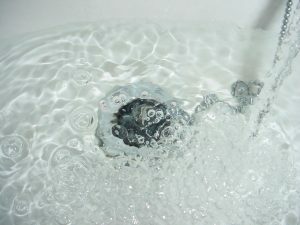 A second type of commonly-used drain cleaning tool is the hydrojet. Hydrojets are akin to small power washers for your plumbing. Like a power washer, hydrojets use water to scour your plumbing, dislodging FOG and clearing it from the drains. Has FOG made its way down your drain? Call our experts today, and let them ‘lift’ the FOG with a professional drain cleaning for your Olympia, WA, home! When you clean out your bathroom, you try to get every nook and cranny. You can scrub the grout, bleach each corner of the tub, and reach behind the sink faucets with a small brush, but there’s one area of the home that you may never reach on your own: the drains. The drains extend all the way to the sewer line, and there is likely debris clinging to the lining of your drain pipes that you cannot clean yourself. It’s important to remember as well that typical drain cleaning chemicals sold in stores are not a viable solution for clogged drains. In fact, these chemicals are some of the most toxic things available for homeowners to purchase. They are very harmful to your health if ingested and may cause injury to the skin and eyes. Furthermore, they can damage pipes, and they really don’t get rid of most of the things that lead to clogs. Slow drains or drains that will not work at all deserve professional attention if a plunger will not do the trick. Plungers are some of the only safe items sold for drain removal, while plumbers have much larger equipment for clogs that are located further along in the pipes. As soon as you notice that your drains are not working properly—especially if it happens in multiple drains in the home—professional drain cleaning is the best option to keep backup from occurring. Plumbing professionals have drain snakes that reach deep into the pipes to pull out clogs or to break up the blockage so that it can move down the pipes. Many experts use video cameras to assess the pipes in order to determine what type of tool to use and where the blockage is located, to repair the problem more accurately and quickly. You may also choose to schedule drain cleaning in order to take preventive action against clogs. When there are minor blockages in your pipes, it may not be immediately apparent. But experts will inspect your pipes in order to make sure that there is no major blockage that could lead to a big clog in the future, and remove any blockage they can. Call us today at Brooks Plumbing for quality drain cleaning in Tumwater.